April 2, 2016 - When in Boston, Pamper Yourself! October 26, 2015 - Is it important to play with your kids? At each phase of your baby’s development, you’ll experience a mix of triumph, pride, and perhaps a little twinge of poignancy that she is growing up so fast. At around 12 months, your baby will begin to walk, grappling with furniture, walls, and any other objects that can help her stand up. It can be a thrilling and frustrating experience for all involved, so here are some tips to help you get your little one walking unaided. 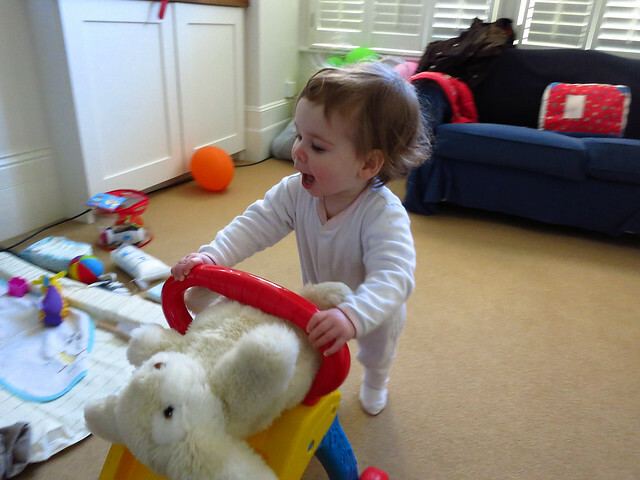 Baby walkers are invaluable when baby is a little unsteady and developing the muscles needed for upright walking. Those that encourage pushing and pulling are recommended over the enclosed type, which can disincentive independent walking if used too often. Baby bouncers are also a great way of getting your little one used to standing on her own and building the strength needed to take those first, crucial steps. When your baby first masters an upright stance, she may not be sure quite what to do next. Gentle encouragement is a must – don’t just swoop in and pick her up. Instead, show her what to do with her legs to toddle short distances, and to get to a sitting position from standing. She might get a little frustrated at first, but this will fuel progress. You can help encourage her by sitting on the ground and holding out your arms to help her step towards you. It might be difficult to watch her take a little fall to the ground, but she’ll be all the more determined to get back up and give it another go. After all, baby steps are better than nothing. As soon as your little one begins to stand and walk, a whole new world of hazards opens up that must be prepared for. While you should always be on hand to supervise baby’s first attempts at walking, it’s good to have some extra peace of mind, as stumbles and staggering will be par for the course. At this stage, you’ll need to keep your floors scrupulously clean – that means no small objects that can be chewed on, tripped on or swallowed. Sharp table corners and the undersides of chairs and desks can result in nasty bumps. They may also grab onto large items of furniture, and an unsteady bookcase or television set can easily topple. Make sure your furniture is either bolted down or fixed to the wall, and keep dresser drawers closed to little would-be mountain climbers. Images by Acme and Neeta Lind, used under the Creative Commons license. Next Article » What makes condoms fail? When in Boston, Pamper Yourself!